One of Africa’s major oil producers, Angola is nonetheless one of the world’s poorest countries. It is a member state of the African Union, the Community of Portuguese Language Countries, the Latin Union and the Southern African Development Community. The geographical areas now designated as Angola entered into contact with the Portuguese in the late 15th century, concretely in 1483, when Portugal established relations with the Kongo State, which stretched from modern Gabon in the north to the Kwanza River in the south. In this context, they established a small trade post at the port of Mpinda, in Soyo. The Portuguese explorer Paulo Dias de Novais founded Luanda in 1575 as “São Paulo de Loanda”, with a hundred families of settlers and four hundred soldiers. Benguela, a Portuguese fort from 1587 which became a town in 1617, was another important early settlement they founded and ruled. The Portuguese would establish several settlements, forts and trading posts along the coastal strip of current-day Angola, which relied on slave trade, commerce in raw materials, and exchange of goods for survival. The Atlantic slave trade provided a large number of black slaves to Europeans and their African agents. 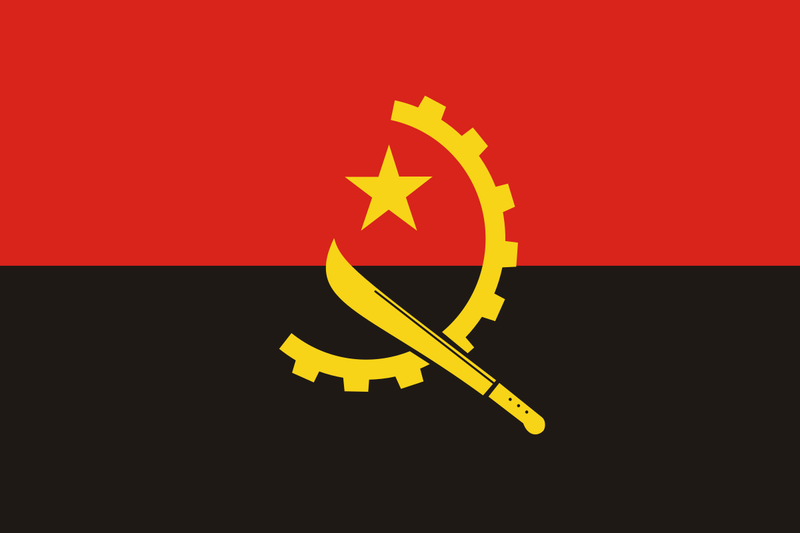 Angola’s motto is Virtus Unita Fortior, a Latin phrase meaning “Virtue is stronger when united”. The executive branch of the government is composed of the President, the Vice-Presidents and the Council of Ministers. For decades, political power has been concentrated in the Presidency. Governors of the 18 provinces are appointed by the president. The Constitutional Law of 1992 establishes the broad outlines of government structure and delineates the rights and duties of citizens. The legal system is based on Portuguese and customary law but is weak and fragmented, and courts operate in only 12 of more than 140 municipalities. A Supreme Court serves as the appellate tribunal; a Constitutional Court with powers of judicial review has not been constituted until 2010, despite statutory authorization. The death of Unita leader Jonas Savimbi in a gunfight with government forces in February 2002 raised the prospect of peace and the army and rebels signed a ceasefire in April to end the conflict. The government has overseen a transition to democracy, although Unita continues to complain that the opposition faces intimidation and lack of transparency at elections. Angola is gradually rebuilding its infrastructure, retrieving weapons from its heavily-armed civilian population and resettling tens of thousands of refugees who fled the fighting. Landmines and impassable roads have cut off large parts of the country. Many Angolans rely on food aid. But oil exports and foreign loans have spurred economic growth and have fueled a reconstruction boom. There have been allegations – denied by the government – that oil revenues have been squandered through corruption and mismanagement. Much of Angola’s oil wealth lies in Cabinda province, where a decades-long separatist conflict simmers. The government has sent thousands of troops to subdue the rebellion in the enclave, which has no border with the rest of Angola. Human rights groups have alleged abuses against civilians. Although the country’s economy has developed very significantly since achieving political stability in 2002, mainly thanks to the fast-rising earnings of the oil sector, Angola faces huge social and economic problems. These are in part a result of the almost continual state of conflict from 1961 on-wards, although the highest level of destruction and socio-economic damage took place after the 1975 independence, during the long years of civil war. However, high poverty rates and blatant social inequality are chiefly the outcome of a combination of a persistent political authoritarianism, of “neo-patrimonial” practices at all levels of the political, administrative, military, and economic apparatuses, and of a pervasive corruption. The main beneficiary of this situation is a social segment constituted since 1975, but mainly during the last decades, around the political, administrative, economic, and military power holders, which has accumulated (and continues accumulating) enormous wealth. “Secondary beneficiaries” are the middle strata which are about to become social classes. However, overall almost half the population has to be considered as poor, but in this respect there are dramatic differences between the countryside and the cities (where by now slightly more than 50% of the people live).